This is the abridged audiobook edition of Talking God. This edition was published in 1989 by Caedmon publishers, an imprint of HarperCollins Publishers in New York City, NY. Each side of the cassettes runs about 45 minutes for a total of about 3 hours. 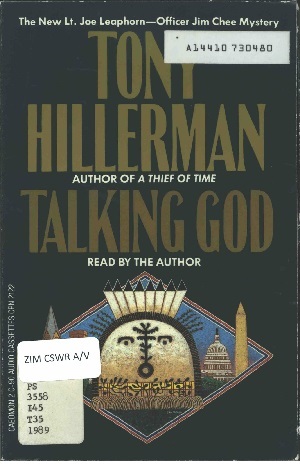 This audiobook version was read by Tony Hillerman himself. The audiobook was produced and directed by John Wynne with music by William Gugala Hirtz. The audiobook has been recorded onto four audio cassettes and includes a cardboard case with a full-cover design. The cover was designed by Peter Thorpe and contains the same illustration used for the 1989 cover of the first hardback edition. The design features the pictorial representation of Talking God in the center with Washington D.C. buildings and monuments to either side.